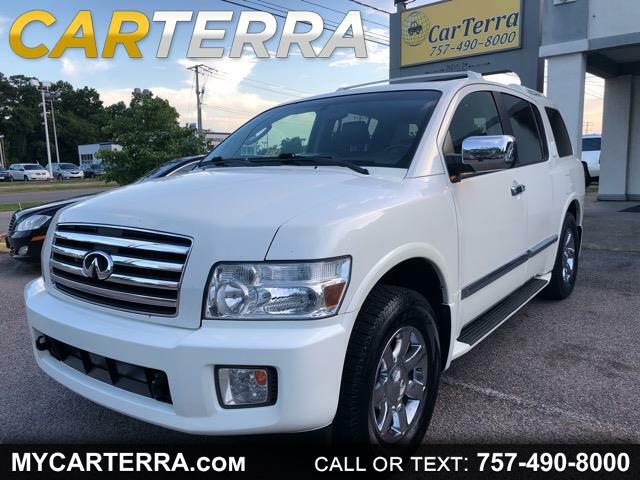 Check out this absolutely gorgeous Pearl White 2006 INFINITY QX56 AWD as a perfect choice of a spacious, reliable and dependable SUV. It is loaded with plenty of powerful features like: cruise control, keyless entry, alloy wheels, air conditioning, power door locks, rear spoiler, separate driver/passenger climate, tachometer, full size spare tire, power trunk lid, heated exterior mirror, splash guards, second row folding seat, third row removable seat, electric brake assistance, running boards, subwoofer, towing preparation package, chrome wheels, second row heated seats, skid plate, front power memory seats, heated exterior mirror, trip computer, CD charger, fog lights, traction control, etc. Shiny pearl white color exterior, no dents or scratches and the black interior is high quality leather, well-kept and clean. Drives smooth! Freshly serviced and inspected. Great Mileage, Clean Carfax, AWD! We can help you get financed - Bad Credit, Good Credit, no problem! Best price in town and on the market!!! We go the extra mile for you at CarTerra! Visit Carterra online at www.mycarterra.com to see more pictures of this vehicle or call us at 757-490-8000 today to schedule your test drive. Message: Thought you might be interested in this 2006 Infiniti QX56.